Given the size and range of various needs in our Dallas ISD community groups, it is no surprise that there is an equally vast partition in approaches for resolving the challenges our constituents face. The great news is that all of those who invest in public education share the same goal - every student should be given access to opportunities that will allow them choices for their futures. But to ensure our district gets to that goal, it is important to confront the challenges we face. Challenge #1: Our city is segregated by race and class, and so are our student outcomes. Former chancellor of public schools in D.C. said it best, “school is the crossroads where all of society’s problems meet.” Dallas is no exception to this reality. In our schools we see segregation by race and by class - and unfortunately - we see metrics that show a correlation with our students’ achievement. One way Dallas ISD is able to measure this correlation is through the Reading STAAR results from the end of each school year. Third grade reading scores are a notoriously strong predictor for future success in college and career. “If children cannot read proficiently by the end of third grade, they face daunting hurdles to success in school and beyond… And those struggling students are disproportionately poor students and students of color” (National School Board Association). Student did not meet grade level expectations. Student approaches grade level expectations. Student meets grade level expectations. Student masters grade level expectations. Below are the results from the 2017 Reading STAAR assessment highlighting the disproportionate outcomes for poor students and students of color who “met” grade level expectations. Acknowledging this challenge can help our District find solutions to address this achievement gap. Stephanie Elizalde, Chief of School Leadership at Dallas ISD makes a statement for our board to continue to raise expectations for all of our students, and that in doing so, our district can earn more credit from the state. Challenge #2: Our Dallas ISD kids suffer when trustees don’t work together. Often times, constituents and school board members across Dallas ISD disagree on whether resources are spread in an equitable manner for students and campuses; yet, no matter which district a student goes to school in, student achievement is comparatively low. 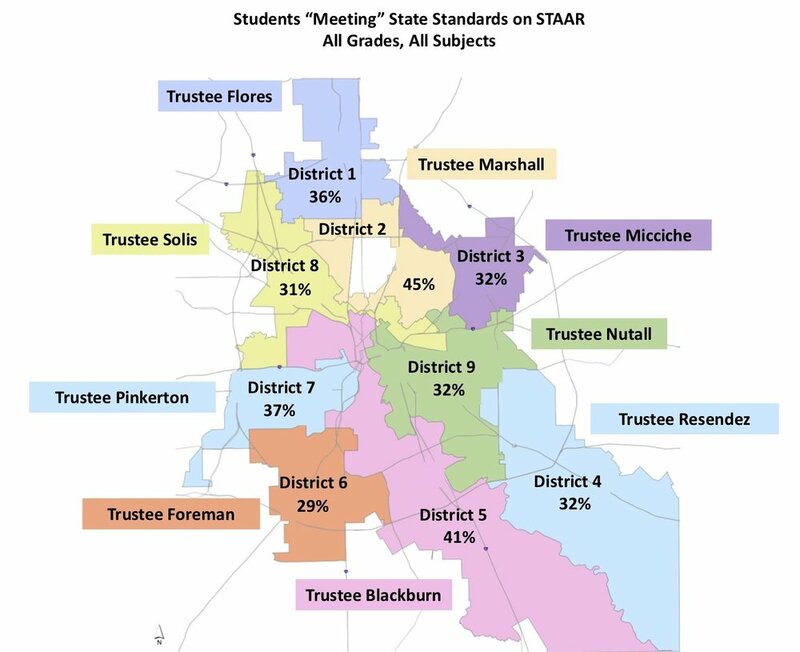 The map above depicts the average percent of students across grades and subjects who meet grade level expectations in the STAAR state assessment. While the metric of 35% of our students performing on grade level is disappointing, Noguera also reminds Dallas constituents “too often we focus on the deficit, and not on the strengths.” Understandably so, our board members focus their attention on areas of high need and high urgency. This academic year, that need is in the district’s “IR” campuses (a state rating for schools that do not meet the state standards and are deemed Improvement Required). Because there are four campuses in their fourth or fifth year of having received the “IR” rating, the Texas Education Agency has shared that they would either take over and manage the entire district, or that they would close the four campuses. The school board came together and voted at the January board meeting to create a plan that would address the “IR” campuses to avoid the state from closing them and/or taking over the district. With continued collaborative discussion at the board table, our school board members can help our Dallas students meet grade level standards, not just escape an “IR” label. Dallas Kids First hopes that by facing our challenges and working together, Dallas ISD stakeholders can more quickly begin to find solutions. Older PostWhat does it mean to be an effective school board member?